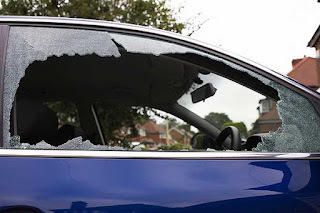 Yeah, my car really got broken into yesterday. Someone smashed in the passenger window and stole the GPS sometime between noon and 3pm. So I was going to write a long blog post about how yesterday sucked, but to spare you I decided to take a different tack on the subject. So here are 3 Reasons My Car Got Broken Into Yesterday. This one should go without saying. How many news stories, newspaper articles, and police updates do I have to see that say, "don't leave a GPS in your car or someone will break in and steal it" before I take my flippin GPS down? Apparently one more. Next time the TV news anchor says, "make sure you hide your GPS or someone will break into your car and steal it" you know what I'll say? "Damn straight! That lady's not messing around!" Stealing is a sin. And it's not like gossip where you think to yourself, I'm just sharing a prayer requests that aren't about me... It's an old-school sin. Shoot it's one of the Big Ten. It got it's own Thou Shalt Not for goodness sake. But here is the point. I know my own heart and I know how deeply sin runs through me. So I shouldn't-we shouldn't-be surprised when someone sins against us. I mean it's a shock when you walk up and the window is gone, but it shouldn't be a shock that a human would do this. It is part of our fallen nature. For a Christian, suffering has the unique advantage of pushing us deeper into our source of joy. That is Christ himself. I trust in my own material possessions. I gain a certain degree of security, identity, and comfort from them. And when I'm stripped of my possessions, I can say, "Why would you let this happen, God?" Or I can say, "God I know that we are all sinners, so I'm not surprised that this happened. But honestly my life doesn't consist in an abundance of possessions, so please let this push me further into Christ for my security, identity, and comfort." For the Christian, and for me in particular, loss is an opportunity to lean into Christ through prayer and discover how he loves me well in the middle of loss. Sorry bout your car but glad to hear about your new endeavor! Proud of ya, bro. Be light, be salt!